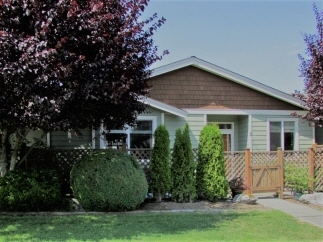 Stylish and meticulously kept patio home located in the 50+ age restricted Belwood Village. Within walking distance to all manner of amenities including shopping, restaurants, Holland Creek trails and Transfer Beach. This well-appointed home offers 2 Bedroom and 2 full baths. Maple kitchen cabinets and centre island along with open concept floor plan create a cheerful and light filled space. Cozy gas fireplace in the living room and sliding doors take you out to your own private fenced patio space. All information should be verified if fundamental to purchase.